Vermillion Pest Elimination, LLC has been a leader in the pest control industry in Richmond, VA since 1970. Our goal is to make your life more comfortable by using that experience to eliminate your aggravating pests. We specialize in problem solving. Where others have failed, we stay focused until your pest issues are solved. Established in 1970, Vermillion Pest Elimination, LLC has been a small, family owned business serving Richmond, VA and surrounding counties for over 40 years. We specialize in a one time service with a full year guarantee. We offer full service for a variety of pests including, but not limited to: ants, roaches, water bugs, bees, mice, rats, bats, and nuisance wildlife. We also offer termite inspections, termite treatments, and termite bonds along with termite inspections for the purchase, sale, or refinancing of your home. We at Vermillion are proud of the fact that we’ve never had a complaint at the Better Business Bureau, and currently enjoy an A+ rating. Ralph Grounds has been the manager at Vermillion for 33 years. He is currently certified in general pest control, termite control, and nuisance wildlife control. 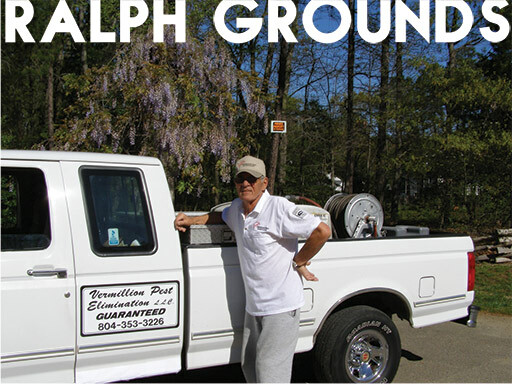 When you call Vermillion, you will talk to Ralph and he looks forward to helping you with all of your pest control issues. Jason Hammon has been the lead technician at Vermillion for more than 14 years. Jason is certified in all fields of general pest control, termite control, and is a Virginia Pest Management Association certified Wood Destroying Insect Inspector. 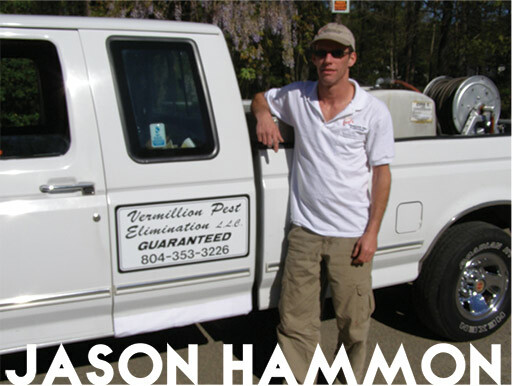 Jason has the knowledge and experience to address and solve any pest control issues you may have.